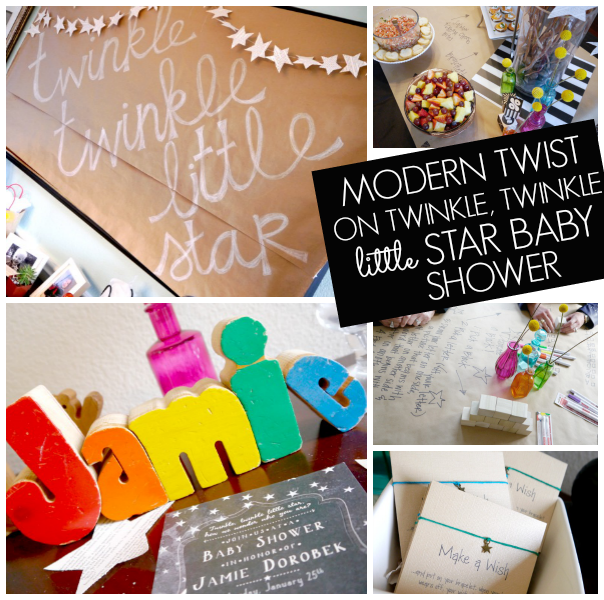 Modern twinkle twinkle little star baby shower - C.R.A.F.T. Baby D is one loved little boy! This was technically his 3rd baby shower. We had a small B is for baby, book, brunch with local bloggers and then the amazing black and white baby shower I shared a few weeks ago. 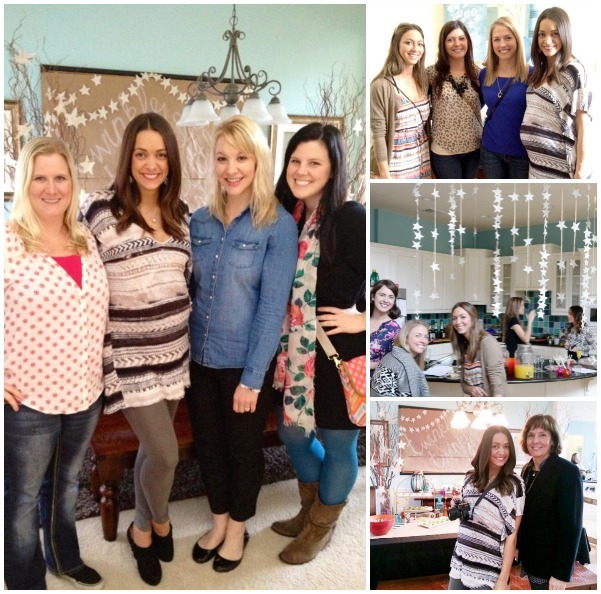 My crafty Austin girls threw us an Austin baby shower! (If you follow me on instagram you probably already saw a few fun pics!) 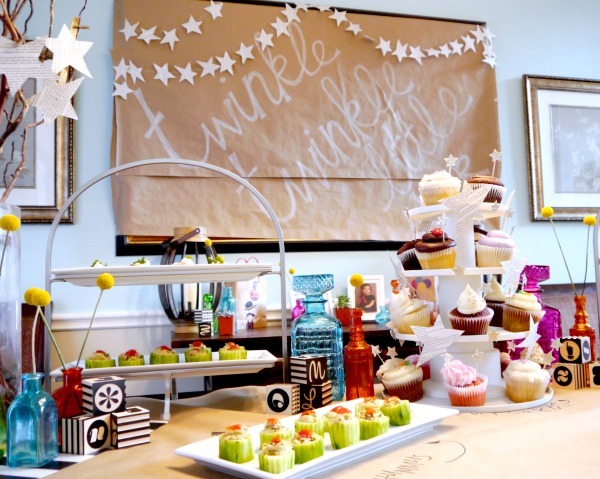 Annie, Rachelle, and Natalia crafted up a modern twinkle twinkle little star baby shower for the bambino and I, and we loved it! 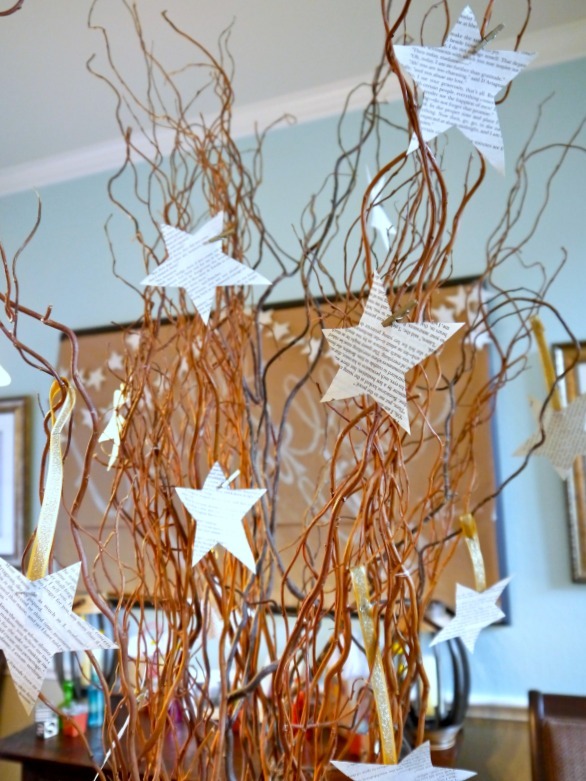 Paper stars attached to twigs with tiny clothespins. I actually helped Annie hand cut tons of paper stars. We also sewed some into banners, but more on that in a bit. They covered the giant mirror in craft paper and added the star banners and a hand written sign. 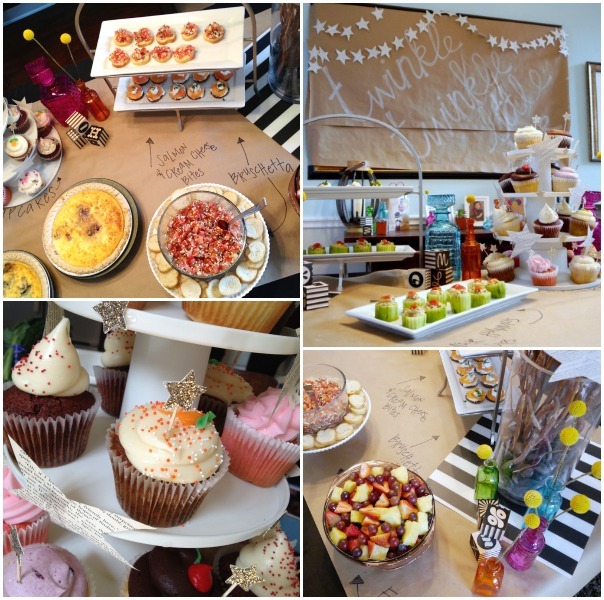 Oh and the food table… the cuteness and the yummiest that existed on this table was drool worthy. How fun are those little cucumber filled hummus cups? Oh and I love those yellow ball flowers, they are called Billy Balls. Here are a few more fun shots of the crafty, fun food table… Just in case you are wondering, that bruschetta was delicious! 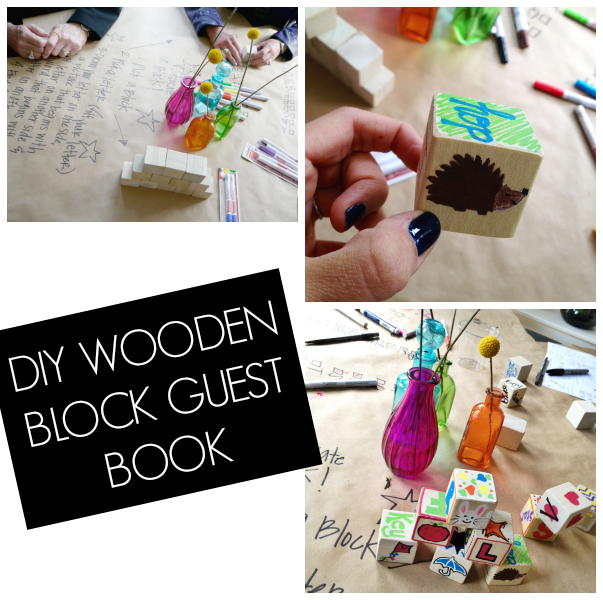 We even had a crafty guest book where guests could sit, mingle, and make Baby D a wooden block! 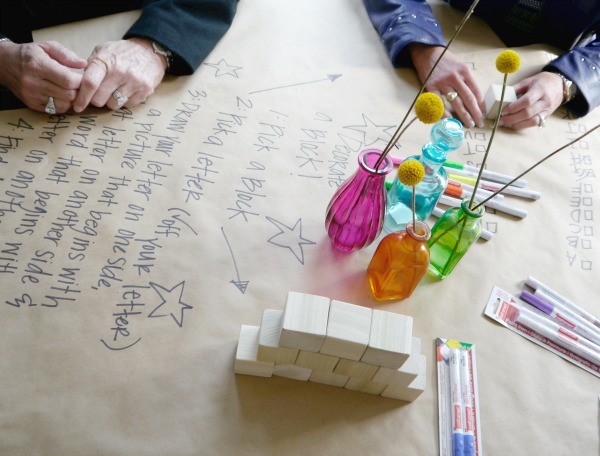 The directions were written on the craft paper along with a alphabet checklist. The checklist was to attempt to get each guest to do a different letter! Here’s a pic of me and my big ol’ 33 week belly! And here’s one of my and my sweet hostesses (Rachelle, Natalia, Annie) and my childhood BFF friend, Betty, who flew in all the way from Florida, and who is also prego with a little boy! A few more fun pics of people and cuteness… That’s me and mama in the bottom corner… It is very, very difficult to get her to take a picture! Thank you to Rachelle, Natalia, and Annie for making me and baby D feel so loved! So, so cute! I think I’m going to borrow a few of these for my bestie’s upcoming shower. 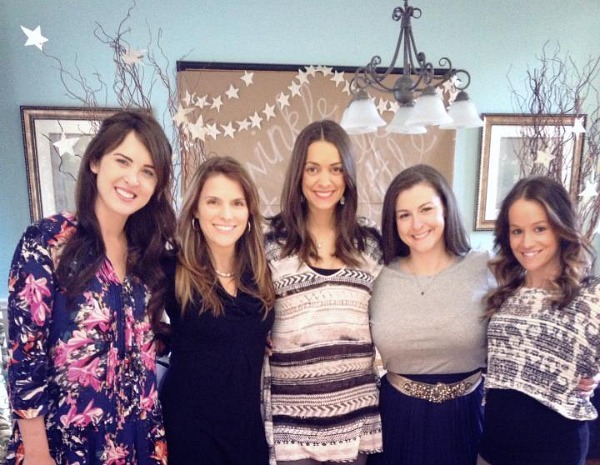 Can’t wait to see your crafty baby shower masterpiece! So whimsical! Loved it! Congratulations on your little bundle of joy! Oh that looks so fun! I absolutely LOVE the idea of decorating a block! I like the onesie idea but I think some people have a hard time with such a big canvas, and babies grow so quickly. I think a set of blocks is such a great keepsake that they can grow with and even display as adults! Hi! My sister wants to have her guests decorate blocks at her upcoming baby shower so I wanted to see if you could tell me what type of markers were used? I really appreciate your help!! We just used paint pens! I’m sure you’re very busy now with your baby, but it’s there any chance you could help connect me with your friend who made the favors. I want to do those for my sister and it’s proving harder than I thought. Perhaps she could let me pay her to help me. Can u please tell me the directions your wrote for the block activity? I’m having a hard time coming up with something. Thank you! I realize this is an old post but, I was wondering if you could tell me the directions for the block activity. This would be extremely helpful. Oh, by the way I love everything about this baby shower. Thank you so much. Can you please send me the instructions for the blocks. Have a baby shower I’m hosting next weekend and having a hard time. Please and thank you. 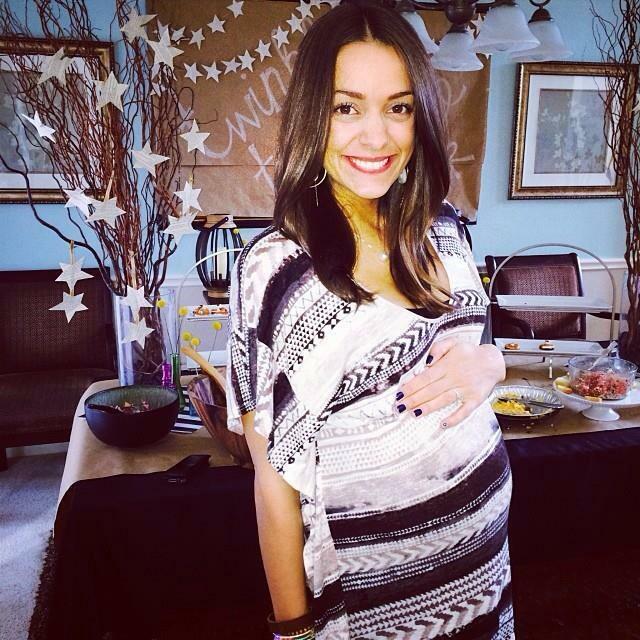 I love your baby shower theme and decor!! 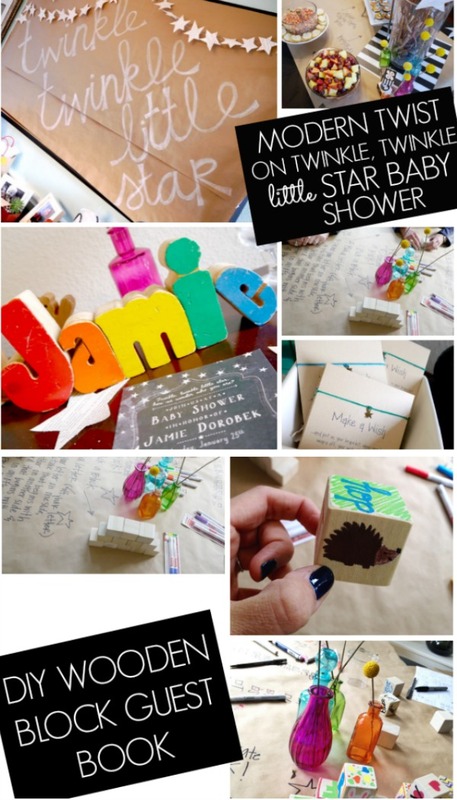 I’m doing the star bracelet party favours for my sister’s baby shower, and I love the font you used on the card stock. Could you tell me what type of font it is? Would love the instructions for the block decorating if possible! Thank you! I love the baby shower favors! 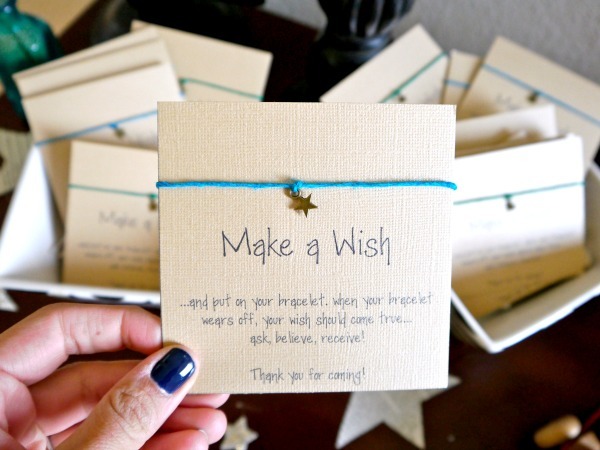 Those make a wish bracelets are adorable!! Would Annie be interested in making a set for my sister’s shower?? So glad you like the bracelets! They were adorable! Unfortunately, Annie does not make them for sale. to make these for a co-worker. Thanks so much!